The European Handball Federation has to announce the withdrawal of the Dutch Handball Federation from the organisation of the 2012 Women’s EHF European Handball Championship Final Tournament, scheduled to take place in the Netherlands from 4 to 16 December 2012. Following discussions between the Dutch Handball Federation and the EHF, written confirmation of the federation’s withdrawal was received today. The organisational right for the women’s national team event will now be offered to an alternative host nation. The EHF is currently in positive negotiations with a number of its member federations to find a suitable host for the event. Participating nations, partners and the media will informed accordingly once an alternative organiser for the event has been confirmed. As a consequence of the withdrawal from the organisation of the event, the Final Tournament Draw scheduled to take place on Wednesday, 6 June 2012 in Rotterdam, Netherlands has been cancelled. 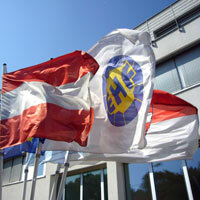 A new date and venue for the draw event will be announced by the EHF in due course.